The application site currently operates as Wolf Business Park, located to the west of Ross-on-Wye and immediately south of the A40/B4260 roundabout. The site is broadly semi-circular in shape measuring 0.9 ha with an existing access taken from Alton Road to the west. Currently, there are three buildings onsite comprising of 10 units accommodating a range of B1, B2 and B8 uses. ii)	Outline planning permission for the erection of new business premises (Use Class B1/B2 and B8) on the land to be retained as Wolf Business Park. The hybrid planning application would seek full planning permission for a new neighbourhood Lidl foodstore on the northern parcel of the site. 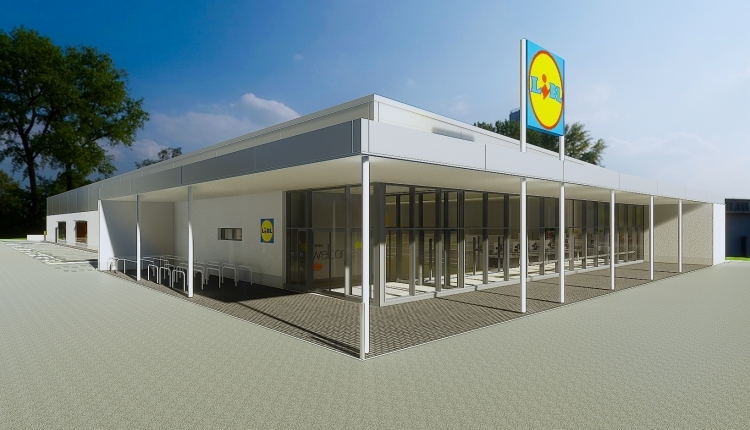 It is the intention that the new Lidl store would compromise a gross external area of 2,127 sq. m with a sales area of 1,325 sq. m, alongside a warehouse totalling 439 sq. m and 269 sq. m of ancillary floorspace. The proposal also includes a total of 127 car parking spaces, including 6 disabled and 8 parent and child spaces. There will also be provision for secure covered cycle parking to the front of the store. The delivery bay would be located to the east of the store. It is proposed that the existing access from Alton Road will be used to serve the store. • The redevelopment of a dated and partially vacant employment area. The detailed element of the proposal would also include a new access bell mouth off Alton Road to serve the retained employment land to the south. This ensures the delivery of the vehicular access to the new business park and demonstrates Lidl’s commitment to investing in the site as a whole. The hybrid planning application would seek outline planning permission for the erection of a new business park to the south of the proposed Lidl store, integrating with the two existing units to be retained. The new business park would be retained by the Wolf family, who have owned the well-established family business that is respected locally. Lidl are committed to working with the Wolf family to invest in the site to provide suitable and modern employment spaces for local businesses. The Support Lidl at Wolf Business Park, Ross-on-Wye petition to Hereford District Council was written by Harriet Cradick and is in the category City & Town Planning at GoPetition.